Finally, I’ve come to the end of this photographic trip down memory lane. Thank you to everyone who has visited this blog, whether or not you’ve left comments. It’s been great sharing one of my favourite places with people around the world. 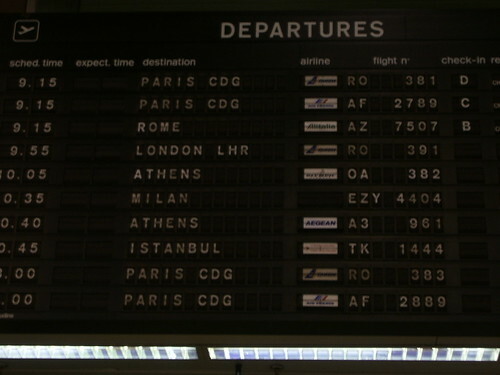 This picture shows the departures at Bucharest’s airport (I went to call it Otopeni Airport there, though it was renamed Henri Coanda airport a few years ago. I can’t get used to that at all!) on the morning of 6 October 2007, and although I’d absolutely loved my time in Sibiu (and in Chisinau (Rep.Moldova), where I spent August and September that year) I was just desperate to get home again. I guess having my wedding less than 3 months later might have had something to do with that!! I hope this blog has given you a little flavour of Sibiu. It really is a fantastic place, and I’d go back in a heartbeat. I’m kind of embarrassed that a stay of about 3 months resulted in enough photos to keep this blog going for nearly a year and a half – I did actually work while I was there, though you wouldn’t think so from this blog! Anyway, it has been really fun for me to relive some memories of the place and of my time there, and it’s been good to give Sibiu a bit of a wider audience.